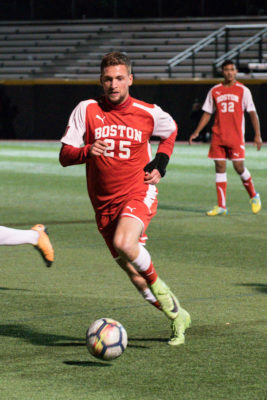 The Boston University men’s soccer team was dealt a blow early: senior midfielder Anthony Viteri would not be returning for his final season with the Terriers due to too many concussions. However, BU (7-8-3, 6-2-1 Patriot League) head coach Neil Roberts entered the year with a positive attitude, knowing the team would have to rely more heavily on its younger players than in previous seasons and find leadership, but he appeared assured that his team could turn its luck around. Well, Roberts was right. A single 1-0 win against Harvard University before Patriot League games began propelled the Terriers into a 6-2-1 conference record that has earned them the No. 2 seed in this year’s playoffs. Although this come-from-behind success for BU did not come easy or without a certain attitude from the team’s athletes. One of these players includes freshman midfielder Toti Knutsson who currently leads the Terriers with 11 points. Knutsson’s presence on BU’s lineup was a longtime coming, but the midfielder’s impact on and off the field has been felt for this season’s team that hopes to overcome arguably one of its toughest challenges of the year: winning the Patriot League tournament. In comparison to many incoming members of the team’s freshman class, Knutsson arrived only a few weeks prior to the season beginning and with a wrist recovering from surgery. The midfielder had also transferred from Coastal Carolina University after spending a semester there. Despite these many changes, Knutsson offered a different perspective on the team. The Terriers’ lack of preparation mentally was evident as they fell to the University of Rhode Island and accumulated a scoreless 0-5 start. Although the losses looked poor on paper, the non-conference games allowed the team to adapt to evolving roles and build a resiliency to keep moving forward in the soccer pitch. Sheikali said his young teammates stuck with the game plans set out and believed in him and the older players that things were going to improve. Knutsson added that during the frustrating period, the players didn’t blame each other. “I think when we started losing, we just hated losing so instead of pointing fingers at anyone why we [were] losing, we just looked at ourselves inside,” Knutsson said. A win was what BU needed to lift its spirits and confidence. On Sept. 16, the Terriers finally got it with Sheikali collecting the game-winning goal. Sheikali said the fact BU won mattered more to him than notching the deciding goal. He noted getting the team’s first win out of the way felt like a relief and as though they had won a championship. This new start had the Terriers looking toward the Patriot League as a fresh beginning and a new competition, according to Knutsson. Sheikali explained that the team treats every game like it is its own championship and once one contest is over, they focus on the approaching game the following day. Despite a loss to Brown University in between beating conference opponents, BU began its successful conference run. During this time, the Terriers formulated their identity around being the hardest working team on the field. Sheikali said the team couldn’t have accomplished what they had without the new players stepping up and playing important minutes, including Knutsson who netted the game-winners against Lehigh University and the United States Naval Academy. Roberts highlighted Knutsson’s work ethic and said it is something that helped him fit into a team with the same persona. Among the many differences between Knutsson’s home country of Iceland and the United States, he mentioned how different American soccer is from preparation to games. He said the sheer physicality of the game requires a lot of effort to emerge with a win. Over the course of a season, the team has faced adversity and adapted, but found success, confidence and its identity. Despite the Terriers’ loss to Colgate University Friday, they will look to the playoffs with the same mentality they have for every other upcoming game and quite possibly end up with an actual championship in their hands.